← TCT approval to push forward with eye on spring construction – similar issues in the north? If you are planning your summer hiking excursion, you may want to add Ontario to your short list. 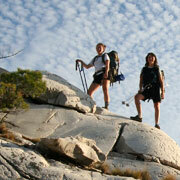 Over the past couple years, Ontario has become one of the leading trail destinations worldwide. If you search trail information on Twitter, chances are, you’ll run across a number of trail-related Twitterites in Ontario. In general, Ontario provides a robust outdoor recreation scene with trails as one of their main focuses. Although hiking and backpacking trails make up the lion’s share of their trail system, bike trails are also beginning to pop up throughout the province. Whereas certain cities such as Amsterdam, Portland, Denver and Minneapolis are well known for biking and other areas such as Colorado, California and British Columbia are noted for hiking, Ontario is quickly and quietly becoming Trail Central by providing great trail opportunities including biking trails,hiking trails and backpacking trails. What sets Ontario apart among the various worldwide trail opportunities is their trail infrastructure and trail support system such as that provided by organizations such as Ontario Trails Council. This entry was posted in Uncategorized and tagged cycling, great trail, hiking, la cloche silhouette trails, Ontario Trails, Ontario Trails Council. Bookmark the permalink.